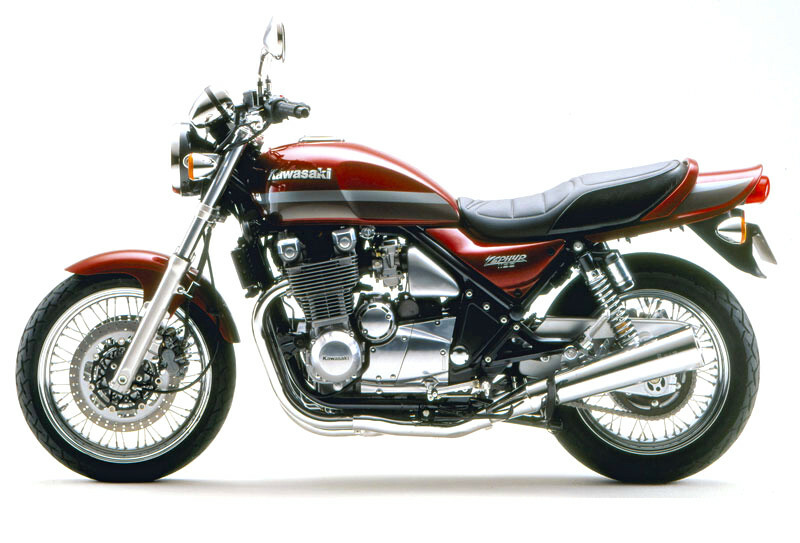 Kawasaki is expected to begin releasing new retro-styled models this Fall. The first model should be a 900cc homage to the Z1, the first four-stroke superbike produced by the Japanese firm in the early 1970s. The design of the original Z1 was largely mimicked by the Zephyr models produced during the 1990s. Unlike the ZRX1200 we discussed a few days ago, the new retro should feature the teardrop-style tank from the Z1/Zephyr lines. Expect a four-cylinder with modern horsepower and torque output. Additionally, together with the retro styling, Kawasaki could likely include fully-adjustable suspension and high-end brakes. 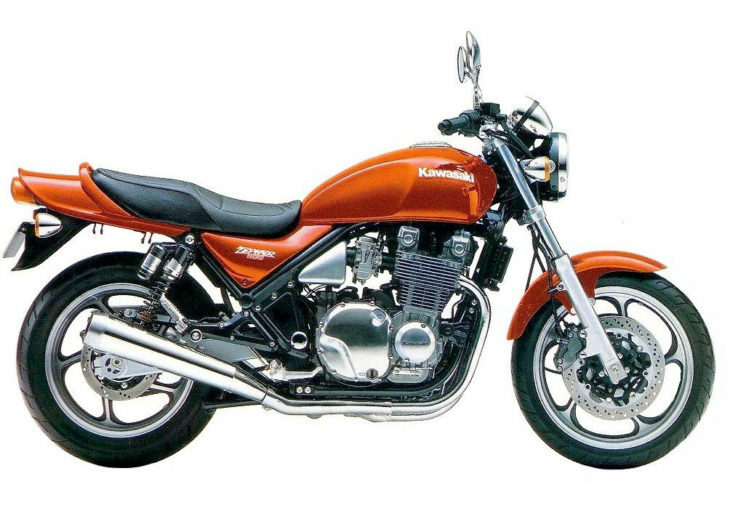 Kawasaki is expected to produce several new retro-styled models over the next few years, including at least one bike featuring forced induction. Should be interesting. Stayed tuned. Sorry, but I like “brick” bmw. Thruxton is too expensive, at least. Two times then CB1100 here. I prefer “brick” bmw in fact, and I’ll finally buy it. They should get Larry Wilcox and Eric Estrada a pitch men! If it’s anything like the bike in the link below, it shall make the CB1100 look abysmal in both cosmetics and performance. The CB1100 should have been more like this. I presume it would also outperform even the current Triumph 1200, and cost less too. Looks wise, the Triumph is special, but this Kawi looks awesome. I’d take this any day over any vintage ELR street model, air/oil or liquid cooled. It looks vintage (except the radiator and gold USD forks), and likely goes like stink, the way it should be. Imagine it in ELR replica green and blue/silver stripes, w/black 4-1 exhaust…yikes! To be accurate the CB1100 has more horsepower than the current 1400 Bonneville, but not as much as the Thruxton which has approx 4 more than the CB. All of the retros run a fairly low redline like 8,000 rpms. The one in the link is also water cooled ( like the Bonnie and Thruxton) so it can run a higher state of tune as compared to the air cooled CB, and could probably run a few more rpms. If it is rev limited or speed limited like the CB it likely wont be much faster. The one at the top of this page which a new model is supposed to be modeled after as well, would be air cooled and likely produce about the same horsepower as the CB and less than the liquid cooled Thruxton, but they would all be in the same neighborhood HP wise. The secret to hp in these bikes is through rpms ( or giant displacement). I had (2) 5 valve 1000cc Yamaha FZ-1s. 125 hp at like 13,000 rpms, but below 8000 rpms both the CB and the Bandit 1200 Suzuki were putting out more horsepower and more torque. WHen the FZ got to 8,000 rpms though, hold on for the top end hit and rush of horsepower that comes from stratified rpms. One one of is confused, likely me! I referred to the current 1200 Bonne. Sorry, not familiar w/any Triumph 1400. 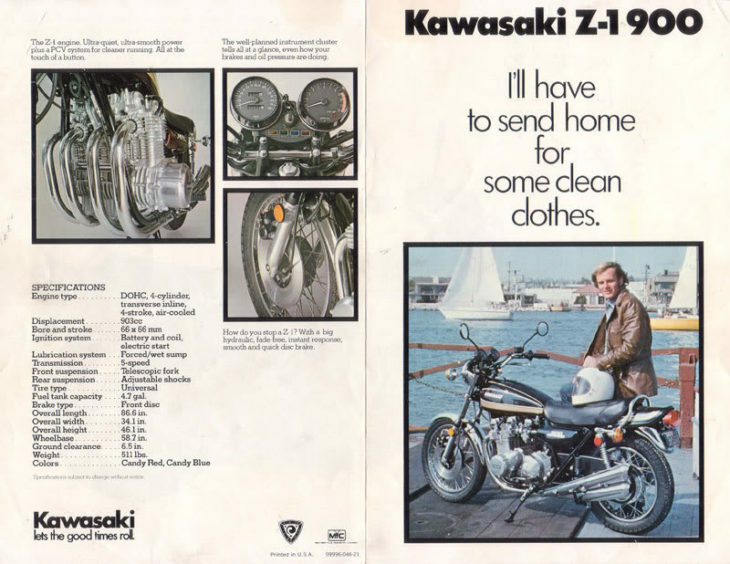 I thought the CB1100 made only about 85hp, and the 1200cc Bonne more like 100? Surely everyone must love the cosmetics on the latest Bonneville models. Provo sorry meant 1200 Bonnie (my younger brother has one, red and silver, pretty thing) anyhow the std Bonnie has the “High Torque” motor according to Triumph and puts out about 79 hp (less than the CB). The Thruxton has the “High Power” motor according to Triumph and puts out about 96 hp although Cycle Worlds dyno chart show about 87 (more than the CB). The CB puts out about 84 hp. Dry weight for the Bonneville is 493, Thruxton/Thruxton R 454/45, and the CB1100 curb weight is 546. I’m not sure how that works out for power to weight ratio for each bike. Re. hp to wt ratio: looking at bike weight alone is misleading/inaccurate. It’s critical to rather measure GVW/gross vehicle weight, AKA fully laden w/fully clothed rider and passenger if such exists. The two ratios (bike alone vs. GVW) are different, and the greater the bike’s load the less is negative impact of increased bike weight and the greater the benefit of increased hp/tq. Retro for retro sake is a little too PT Cruiseresque. It’s time to start worrying when your best ideas are 50 years old. Especially when you have to bring them back after they already failed the test of time. I do like the old authentic classic iron though and the way they have defied all the engineered obsolescence our corporations can throw at them. “Retro” is just a word (that I truly wish BMW’s Chris Bangle had never coined). Motorcycles that people use this word to describe are just basic, general-purpose motorcycles. An idea “…50 years old”? It’s an idea that should never end, being the opposite of “modern” (which is always only temporary and due to become obsolete). Retro fits what these bikes are about. You cannot get more general that general-purpose motorcycles. Hardly an idea at this stage of history. a reduction in price will increase demand for every co?Irmeunsf that's what you were taught, hydra, then perhaps you might benefit by re-learning some of the basic concepts of economics. Here's a link to a very simple explanation of . If you read the simple explanation of the Law of Demand, you will not find any statement that an increase in price results in an increase in demand for every single consumer. Please have at least 110hp. Please? Please? I want nothing less than 115hp. I’m having a price is right kind of day, so 116Hp for me. What did JVB just bid? 116Hp? O.K. – 117Hp Mr. Barker (As JVB glares at me indignantly, even though he just did the same thing to MGNorge). Ha..ha… I’ve always thought that the Price Is Right should have required some sort of gap – let’s say $10 or $25 between competing bids. You do realize these pics are of the original Zephyr, right? Those pix are from ’92 and ’95 but hey, who knows how such a bike will be designed. That tail was something of a styling cue of the model though. Could the retro fad be because only us old dudes are buying motorcycles these days? I’m also in love with Indians with their BIG air-cooled engines! Even Harleys…! But then again, I love EVERYTHING on two wheels…! Let it be a Panigale or a 125cc learner bike! So I can’t speak for men in their 20s and 30s…! Heck, I even miss 2-Strokes! The average of new motorcycle purchasers in 2012 was 47. Vega, we’re glad you’re here. Moto needs the young to return to it. So they can’t make the ZRX pass the latest emissions but they’re giving us a whole new line of retros. Makes no sense at all. I sure hope they resist the urge to use spoke wheels. Those things were discontinued for some specific reasons. Being attractive wasn’t one of the specific reasons. I like it. I had four Honda Nighthawks and a KAW ZR750. Right out there in the breeze. Nothing fancy. Not too expensive. Nice mechanical sounds from below. Cool looking. Are we beyond retro? I guess not. Kawasaki is doing some cool things these days. I don’t need all the expensive doo dads everyone whines about. Just give me decent adjustable forks and shocks. I’m kinda thinking anyone against valve lash adjustment via shim under bucket has not owned a bike with such. What’s not to like? If it idles OK, if top end noise is moderate, and it doesn’t burp/backfire on deceleration, totally and completely ignore the OEM valve service interval. Primary reasons for the interval are to satisfy the EPA and to shift financial liability to the owner in rare cases of owner grotesque abuse and/or ignoring the above advice. Lesser reason is to get consumers in the store to increase dealer profit margin. An honest pro wrench can and will confirm the high ratio of motors w/valve lash clearance within spec and no adjustments required. Wrenching since 1974 and needing to remove cams to change shims is very rare as valves are almost always in spec with shim under bucket. I have always questioned the logic behind the anecdotal “lack of top end noise” as an indicator that valves do not need attention.In my experience (I’m no mechanic, but out have checked and adjusted many valves), valves make less noise as they tighten up. Clatter would indicate loose valves, and I can’t remember an instance in my admittedly limited experience where a shim under bucket valve got looser. Could some of the more experienced wrenches explain this one to me? Jeremy, the life long Honda mechanic that services my bikes tells me unless you are experiencing a drop in mileage, and hard starting or unusual noises in the top end it’s virtually a waste of time to check the valves on a shim under bucket system. I insisted he check the valve on my ST at 54,000 miles and was experiencing none of the troubles he sited. They were all in spec. That cost me $198.00 for the piece of mind lol. The Japanese all 4 mfgs and Triumph are certainly sold on the system. My brothers Triumph Bonnie valves we checked ourselves because it’s easy, at 36,000 miles and all in spec. I haven’t checked the CB1100s valves yet at 24,000 miles. No issues with noise, starting or gas mileage. Mechanic says they dont need to be checked. I’m thinking maybe this winter for piece of mind lol. I would think it also depends on how hard you ride the bike. Presumably bikes that spend much time up in the upper reaches of the RPM band (like up around or above 10k RPM) might be more likely to need attention to their valves. Cars with shim under (or over) bucket valve actuation these days seem to have their lash set pretty much for life at the factory, but cars typically have pretty limited redlines. The buckets are machined in the Mazda and Ford 4 cylinder engines, no shims, recommend checking at 150K. 2008 250 Ninja spent most of it’s life above 7000 rpm, never changed a shim, but had to replace the cam chain at 53K. Intake valves in shim under bucket will rarely vary at all on the other hand the exhaust valves will start to lose clearance over time.I never hear any difference from a properly (within tolerance)valve and a valve that has tightened to a range that is out of spec.I believe your mechanic is on to something about gas mileage though.Noise I have usually found to be related to cam chain adjustment. Gham, you said exhaust valve clearances change “over time”. Care to elaborate? Does that mean beyond 25K miles? Beyond 50K miles? Beyond 75K miles? Beyond 100K miles? Mickey, I’ve seen them move in as little as 6K miles. Exhaust valve clearance allows an appropriate amount of “seat time” for necessary cooling. As the clearance reduces so does the opportunity to shed the intense valve heat into the head. If you’re starting with .004″ clearance, a drop to .003 is a 25 percent decrease in valve cooling. The valve runs hotter and gets softer even though the bike will run exactly the same. As the valve gets hotter the stem gets stretched reducing clearance and accelerating wear. Your mechanic is wrong. If you wait for the bike to start running bad before you check the valves it’s too late. You’ve already burned the valves at that point and they need to be replaced. You can bring the clearance back to spec but the stem will quickly stretch more and the seat will distort, eventually breaking and bashing a hole through your piston. You might get lucky if you sell the bike before you drop a valve but you should never allow you clearances to be out of spec for long. Please give it a centerstand and grab handles. If Kawi does that and keeps it relatively light I would be very much interested. during my ho-hum 19-year career of mc riding i’ve owned two kawis, both of which i enjoyed very much: 2005 vulcan 1600 classic, 2009 ninja 650. i could “eagerize” over a modern rendition of that ’92 model with its mag wheels, and, yes, let’s pray for shaft drive – woot! too bad we can’t have hydraulic valves 🙁 i hope we don’t see a catalytic catastrophe for a muffler. “too bad we can’t have hydraulic valves”- Harley was going out of business before they came out with hydraulic valves. Hydraulic valves are very underrated. i have two totally different bikes-a Gold Wing and a Sportster. But they both have hydraulic valves and that’s very important to me. Not a 15 or 1800 Wing, and valve adjustments are the least of your worries with a Sporty. Goldwing 1500’s and 1200’s had hydraulic. 1000’s and 1100’s had screw adjusters, very easy and very accessible to check and adjust. Pretty hard to beat if you keep your bike 40 years and hundreds of thousands of miles like I did. Right, hopefully it does better than the Zephyr. I couldn’t do much worse. I had a 750 which was a nice little bike but pretty dated even when it was new. With more modern brakes, engine and suspension it would have been a great bike. I got a secret stash of cash for this Z. These things I can almost guarantee.. it won’t be mid 400 pounds wet weight lol, it won’t have shaft drive, it won’t have spoke wheels, it will have shim under bucket valve adjustment, it will have goofy exhaust nobody likes, it won’t have enough horsepower to please the hp freaks, it won’t have over 5 gals of gas capacity. It will be a nice motorcycle regardless. That said I owned a Zephyr 750 which was one of the prettiest bikes I’ve ever had. The 750 profile was in better proportion with the rest of the bike than the bigger engine and the red paint positively glowed. The wide can spacing indicates can followers. We can live without all of that. But if it doesn’t have a beak, it’s a deal breaker. Dave, you beat me to the beak comment. Right on about the exhaust. It sure won’t look as good as the one above. this made me shout at my ol’lady. Please give it 1200cc watercooled mill, 5.5 gal gas tank, chrome fenders, shaft drive, mag wheels, 45mm or better inverted forks, 61 inch wheelbase, round headlight w/ beak delete in a sub 575 lb pkg. Am I asking too much? And you’re willing to pay how much for all this? What you’re asking for makes me think more of an updated version of the original Honda flat-4 Gold Wing (before it became an RV on 2 wheels), rather than a naked, updated Z-1. They’d both be pretty cool. If the actual bike looks much like the picture in motorcyclenews today, I think I’m going to have a big argument with my wife in 2017….. I have to agree. If that bike were real, it would immediately jump the XSR and Thruxton, in my book. I can tell you right off the bat which of the design features in the artist’s rendering won’t see production though: the exhaust. I actually kind of like it. I can tell the artist tried to make it at least a little cartoonish, but he fell well short of what Kawi’s current designers would do. In fact, if you make the end cans a bit shorter, I might actually say it was attractive. So of course Kawasaki will put something ugly and absurd in its place instead. Which artist’s renderings are you referring to? The photos above are of the actual bikes built in 1992 & 1995. The pic referenced is on MCN. I’m not sure you’re right about the exhaust. The rendering on MCN shows an ugly-ish collector/catalyst covered with a shield to minimise the aesthetic impact. Not the sort of thing that a non-technical designer would bother with. So I’m hopeful that the packaging could be as shown. Their strap line “Let the good times roll” together with their adverts, all sparkly paint & chrome in the sunshine had a profound affect on me as a youngster. Their strap line “Let the good times roll” together their old style adverts, sunshine, sparkly paint and chrome had a profound affect on me as a youngster. Proper looking motorcycles! Let’s hope they come out like that (and that people buy them). I’m very anxious to see and learn about these bikes. 900cc displacement is a nice homage to their original KZ900 Super Bike. The Zephyr models looked infinitely better than any iteration of the liquid cooled ZRX series. The better the 900 approaches the mid 400 lb range (curb weight full fuel tank), and the better is performance, the more interesting am I.
Honda’s current CB1100 is just too milk toast. Back to motorcycles. New Z-1 would be great. Always good to hear from someone who appreciates history, Larry.